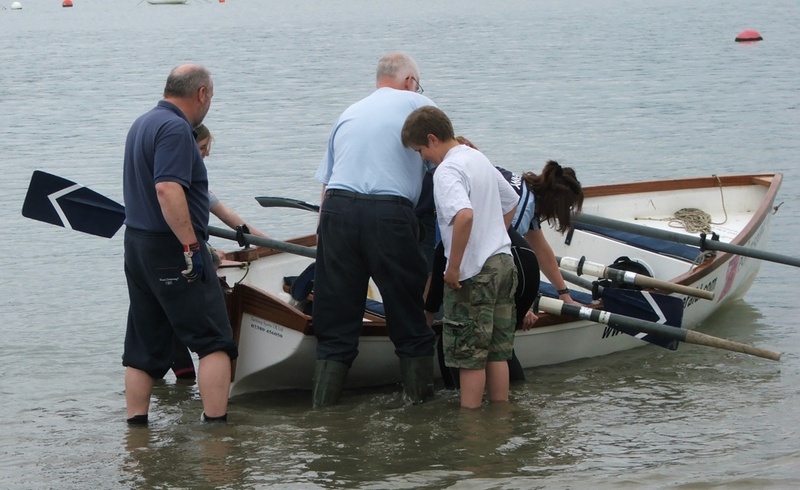 We're not sailing this weekend. One of the reasons is the weather. 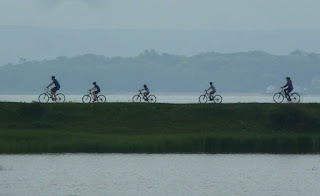 Even the ducks in the foreground of the picture below below considered it to be; well weather for ducks! But the real reason is the crowds, all the nice harbours of the Solent are going to be full. 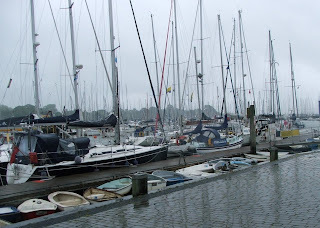 Above is Lymington quay on Saturday morning, despite the early start and the bad weather the boats were already rafted up 5 deep in places. 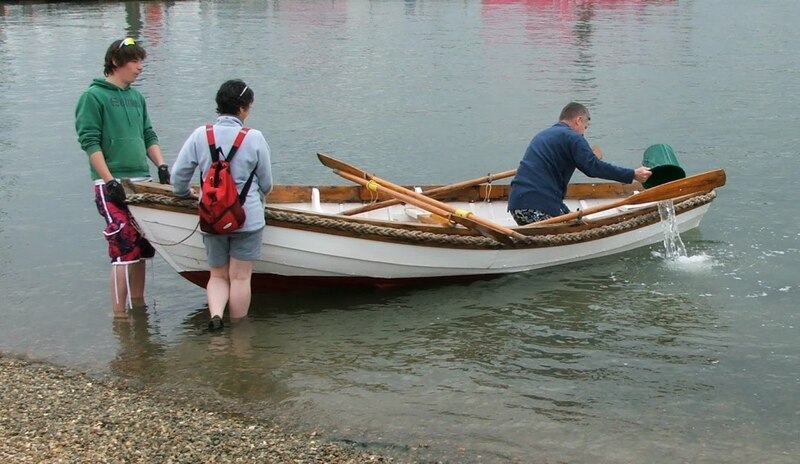 There's a mid day high water, so if the weather improves you might just see us rowing in the upper reaches of the Hamble to Botley while everyone heads out to sea. 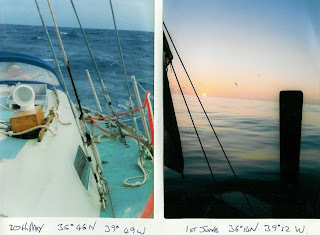 Twelve years ago, Erica and I were in mid Atlantic, sailing homeward somewhere between the Virgin Islands and the Azores - 35 degrees 46'N 39 degrees 49'W to be precise. Every evening we would tune the radio and listen to Herb Hilgenberg. 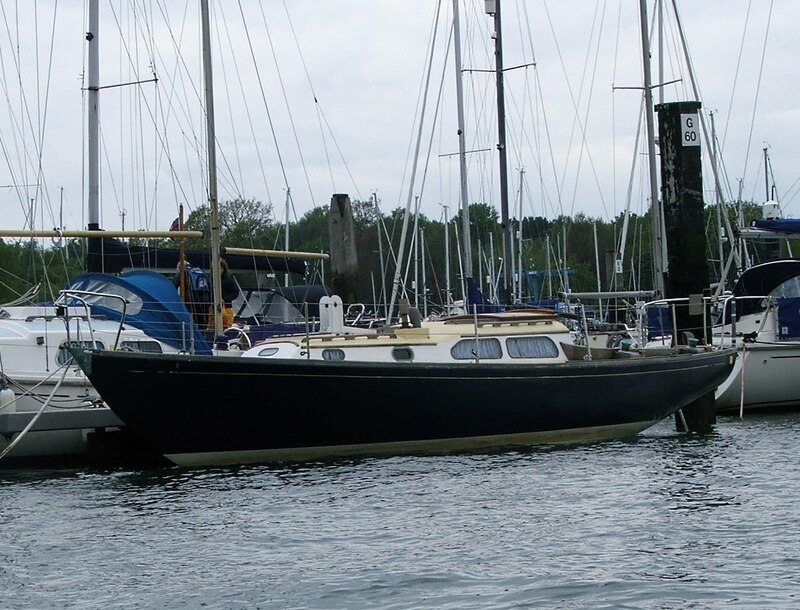 Herb, a Canadian, provides weather information via SSB radio to yachts in transit across the Atlantic, bound for Europe. Herb is remarkable, spending several hours every evening to relay individual weather information to yachts, forecasting the next 24 hours. 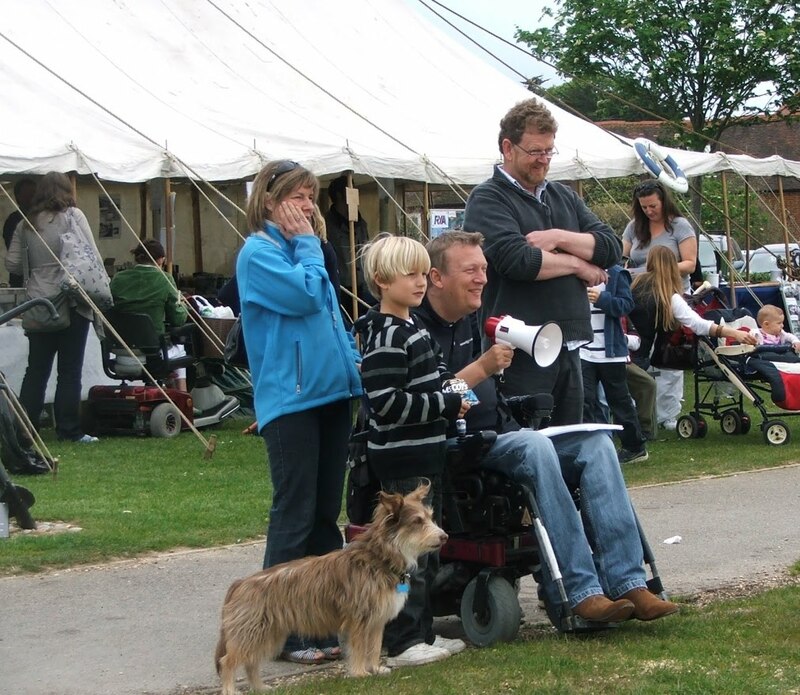 As you can see from the photo things could change quite quickly. 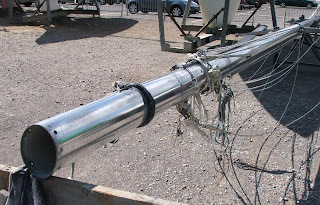 Since we only had an SSB receiver, we couldn’t talk to Herb, but by tuning in and listening for the yachts positions we could track those who were close by (within 100 NM or less) and get a very good picture of the weather conditions we might expect. 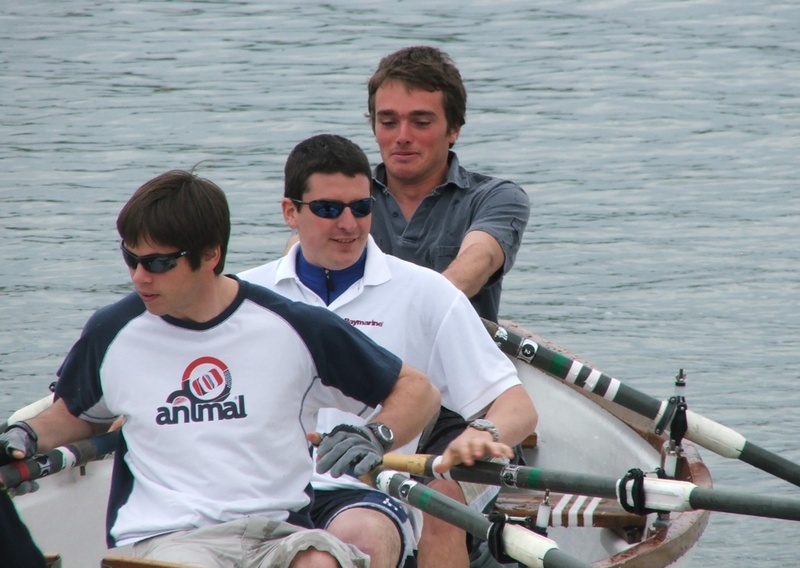 It was however a time consuming and tiring process. 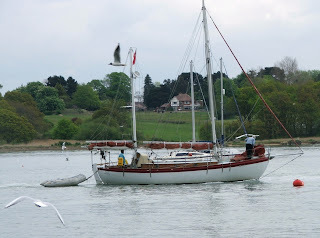 Herb would be on air for two or three hours each evening, so while the first watch (Erica) went off for a rest, I would be tuning in and plotting the position of each yacht as it came up on Herb’s call. No less tiring for Herb who does this every evening. 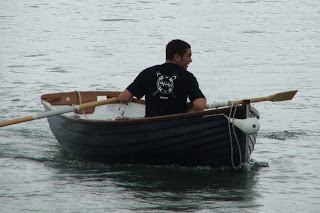 Nor is it as simple as following the same boats. 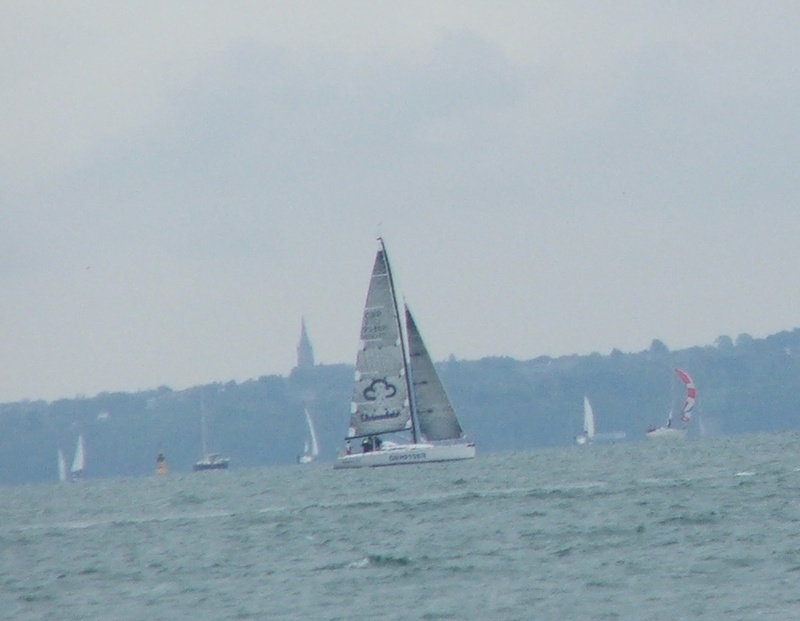 One might be close one day, but take a more northerly or southerly course; others were much faster than our yacht -Blue Clipper. One particular Australian yacht was exactly on our track, but she was an ex racing yacht and fast, they were covering 200 NM a day compared to our 100 and were soon out of useful range. We were just so grateful for such fantastic weather information and guidance, it’s a shame we didn’t have a transmitter so we could thank him. So Herb, this is a belated and very sincere thanks. As you like to say "Have a good watch"
This delightful day boat is based in a small creek on the river, but was in the yard over winter. I managed to speak to the owner, sadly details were very scarce. She was built in Devon, as a one off based on the lines of a traditional boat, sadly the owner didn't know either the builder nor the design on which she was based. 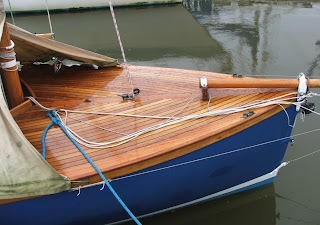 I can't decide if that lovely varnished foredeck looks good in spite of the rain or all the better because of it. 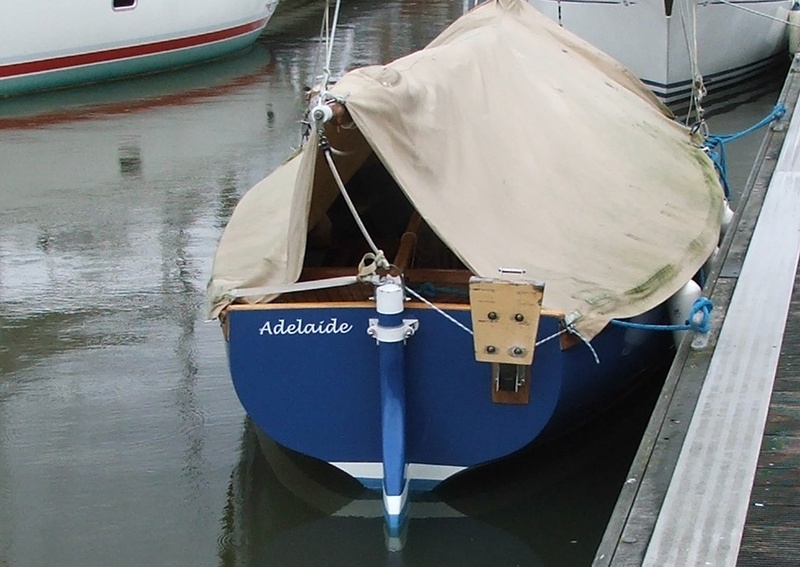 Her name is Adelaide, apologies for the poor quality photos, it was difficult getting a good angle, hopefully she will be out sailing in the summer for some better shots. 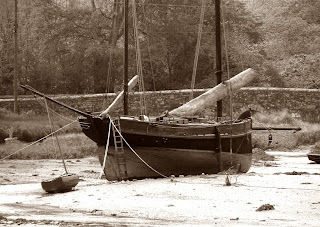 An old lugger at rest, dried out on the shingle at the top of the creek. You might be forgiven for thinking it's a scene from 100 years ago, but the telephone pole to the left is a bit of a give away. 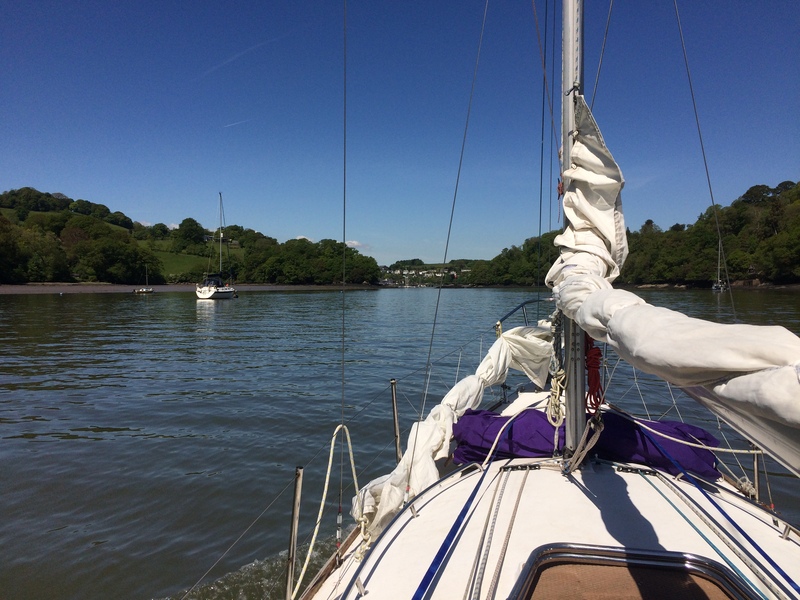 It's the Helford River in Cornwall, up by Gweek just three years ago. 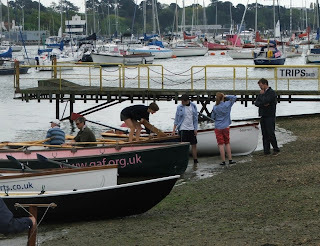 As well as watching the rowing, Saturday was a great day for checking out the passing boats as they went downstream past Hamble quay, many of which were local gaffers. 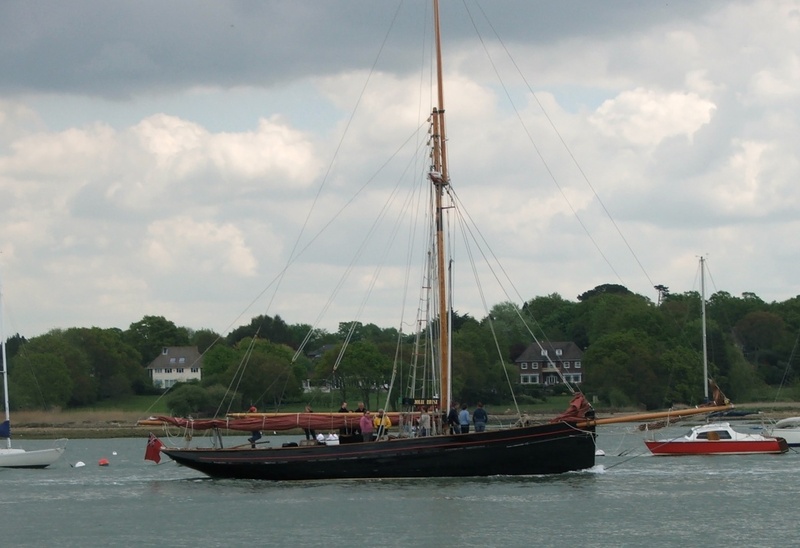 The first is one of our most famous local boats Jollie Brise, the Le Harve pilot cutter. As well as clashing with the football FA cup, the Hamble River RAID shared the weekend with the Three Creeks Race, which this year was being organised by the OGA - Old Gaffers Association. 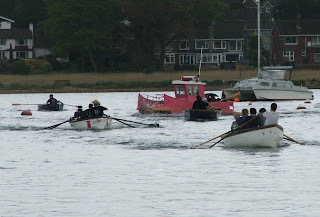 I don't know if any of these boats were racing, this one is relatively new to the river. A Memory class, these are built locally, sailing with a couple of well positioned seagulls to give the picture a really salty feel. 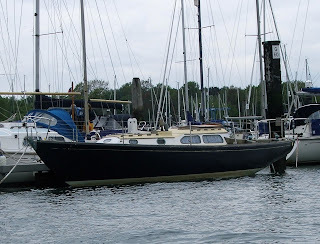 And one of my favourite boats, Rula based on a Norske 35, I really should have bought her when she was for sale a few years ago!! 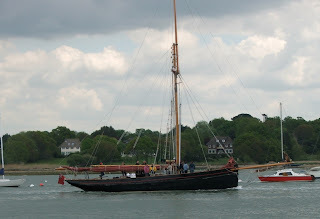 I know this isn't a gaffer, but she's very pretty, one of the local XoD fleet. 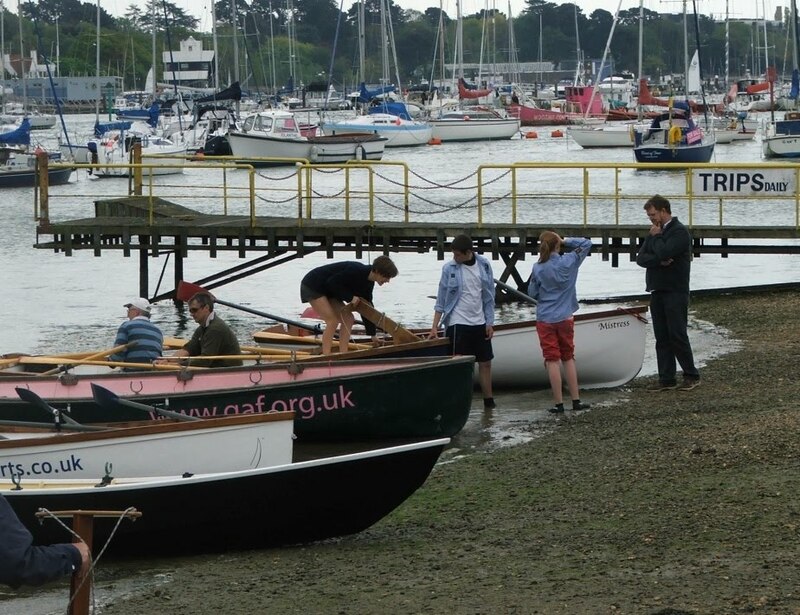 The annual Hamble River RAID took place on Saturday, sadly the early sunshine gave way to some grey skies as the fleet gathered for the 12.00 start. 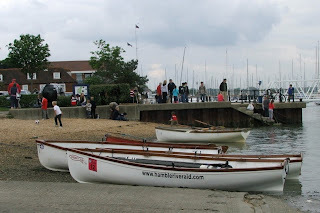 The fleet was mostly made up of Bursledon gigs, a locally adopted traditional rowing boat, they were drawn up on the foreshore by Hamble town quay. 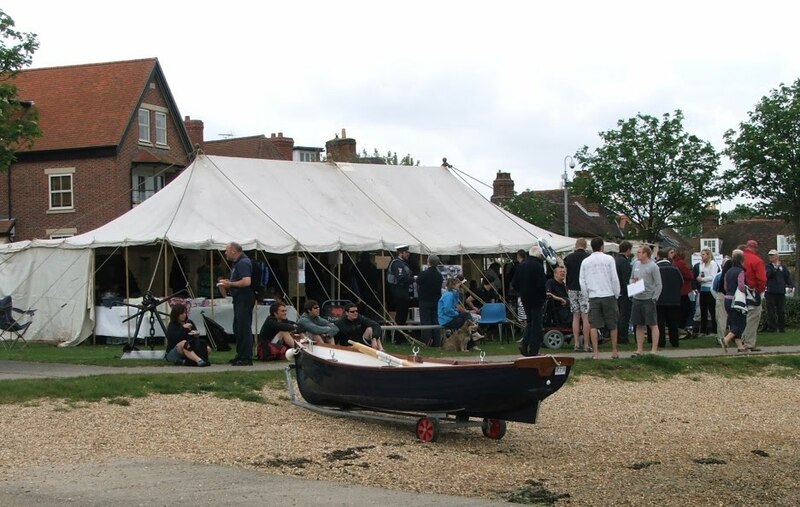 The RAID is a fund raising event in support of the local Sea Scouts, many of whom were on hand to marshall the boats and run the refreshment tent. 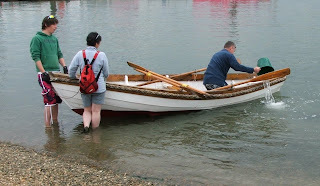 This Scandinavian style double-ender had been launched after 3 years ashore, taking a lot of water through the seams which hadn't had the opportunity to "take up", the crew spent almost as much effort bailing as they did rowing. 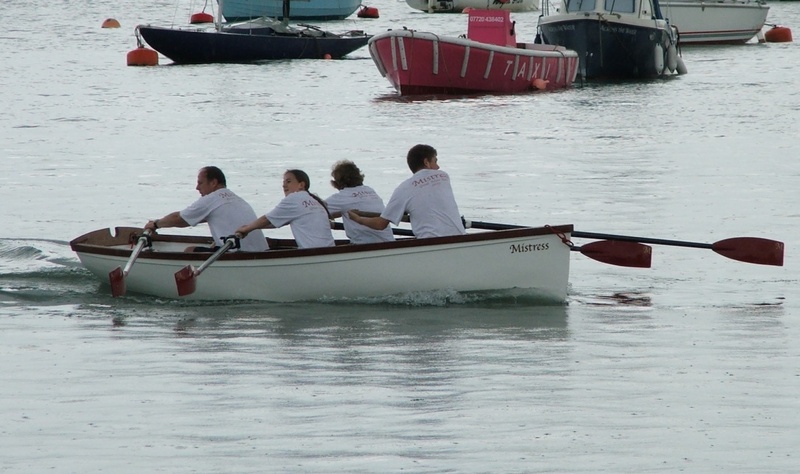 The established "Le Manns" style start has the crews running down the beach from the start. Here the team from the newly formed Hamble River Rowing run down to their gig, the starts are staggered by two minutes to allow each crew to get away. 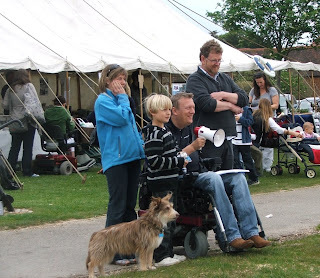 But then they appeared to stall, for an impromptu discussion about getting in and where they are going to sit. 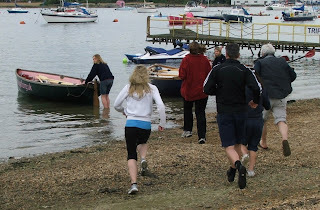 Before getting away at a good pace. 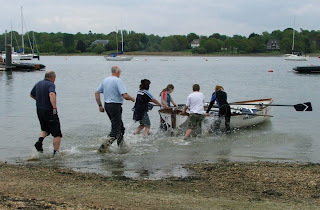 They received the Methuselah Trophy for the crew with the highest combined age - there is of course no truth that Chris was their "secret weapon"
After rowing the course, which took them up river to the Jolly Sailor, the crews had to contend with a heavy rain shower at the finish. Here three gigs and an Egret sprint across river on the last leg. 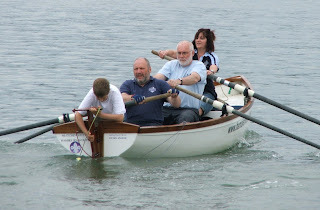 Local gig "Mistress", crewed by the Hand family. 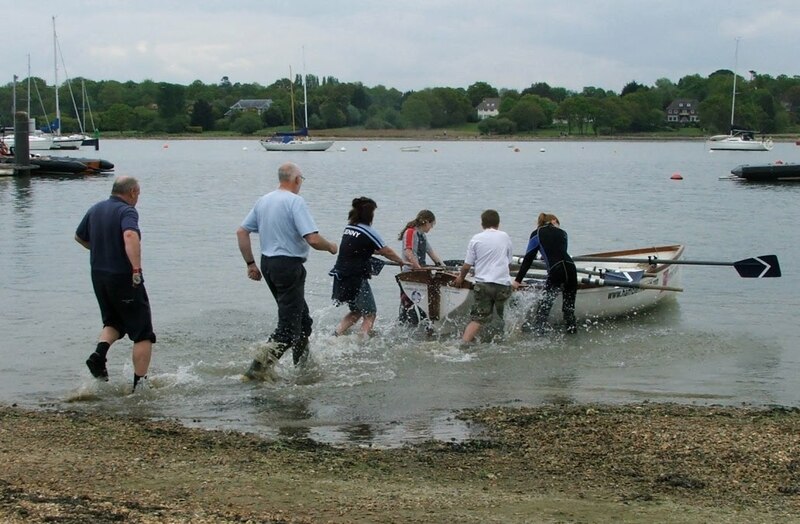 John Dyte heads for the beach and the finish in an Egret dinghy to win the prize for the first non gig. Another well turned out boat, the all women crew getting ready to leap ashore for the finish. With the Hamble River Raid in prospect this Saturday, when a fleet of Bursledon Gigs and other assorted craft race up river to the Jolly sailor and back, I thought this offshore rowing race might be of interest. Fogo Island and Change Island, stand off the Newfoundland coast in Canada. For the Third succesive year, as part of their annual regatta, the islanders will be holding "The Great Fogo Island Punt Race to There and Back" on July 27th. The Fogo Island punt is a traditional working boat, rowed by two men, it's not dissimilar to our own Bursledon Gig. 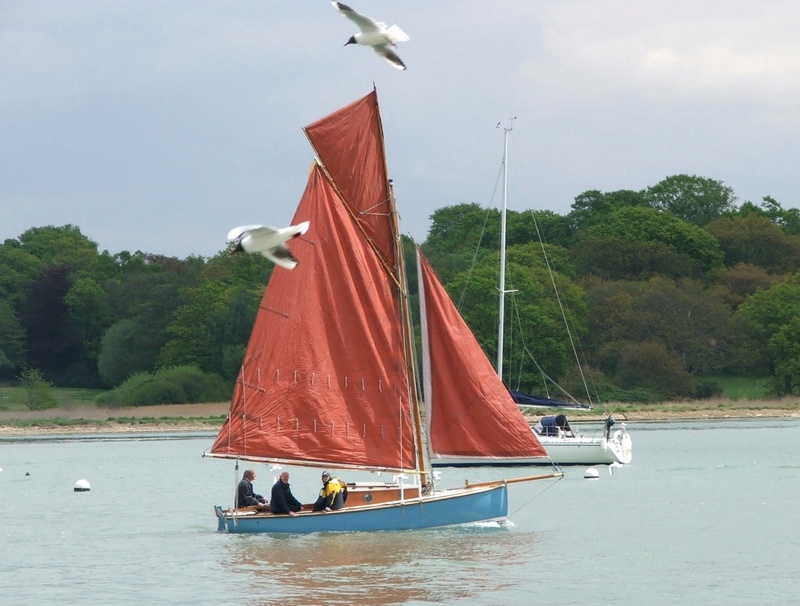 Doryman kindly dropped by with a comment on the 8 Metre Classic to say how similar she was to his own Phil Rhodes racing sloop Caper. 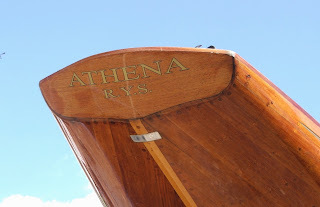 Sadly we don't have many Rhodes designed yachts over here, but there is one on the river. 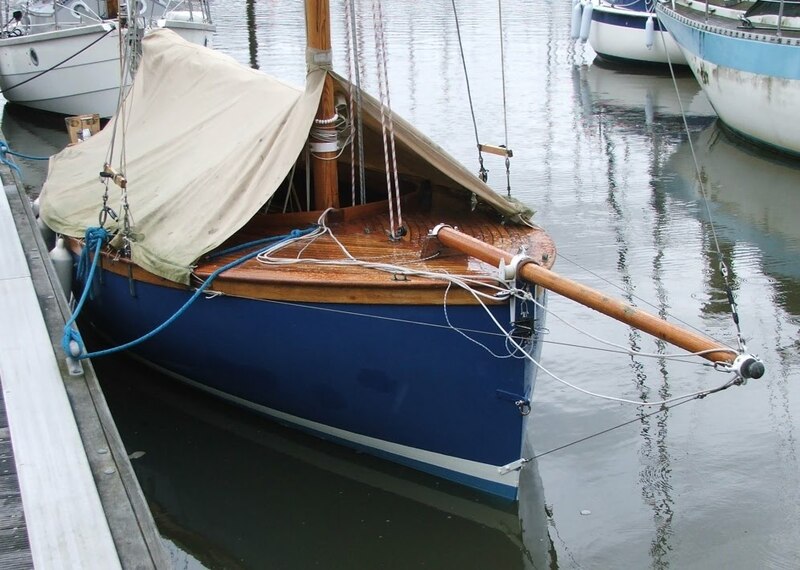 She's been up for sale for a while (over a year if I recall) and is currently without a mast, which hopefully was stored for winter. She's a pretty sloop, not quite is the same league as Doryman's one design racer, but a good sea boat. 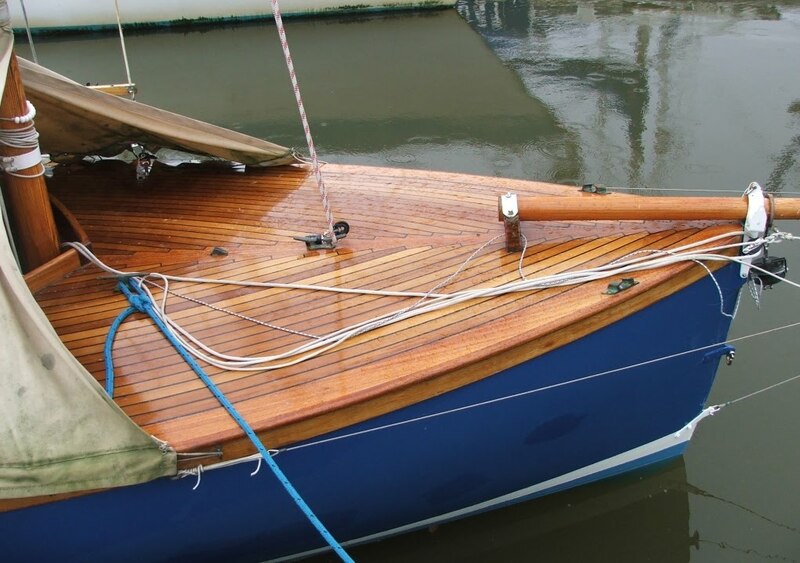 Sadly what puts people off these classic older designs is lack of space below, certainly compared to a modern boat. 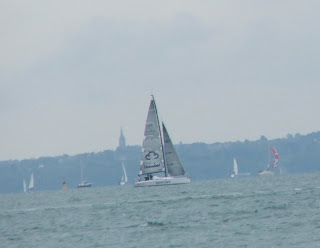 Sailing back from Cowes on Saturday I was watching this racing yacht. We were a long way off near Calshot, but I remember thinking she seemed to be heading right across the Bramble Bank. Was she possibly further away or perhaps closer than I thought? Maybe the tide was higher than I though since it was only neaps? No, she suddenly stopped dead in the water, presumably with her keel stuck hard on the sand. 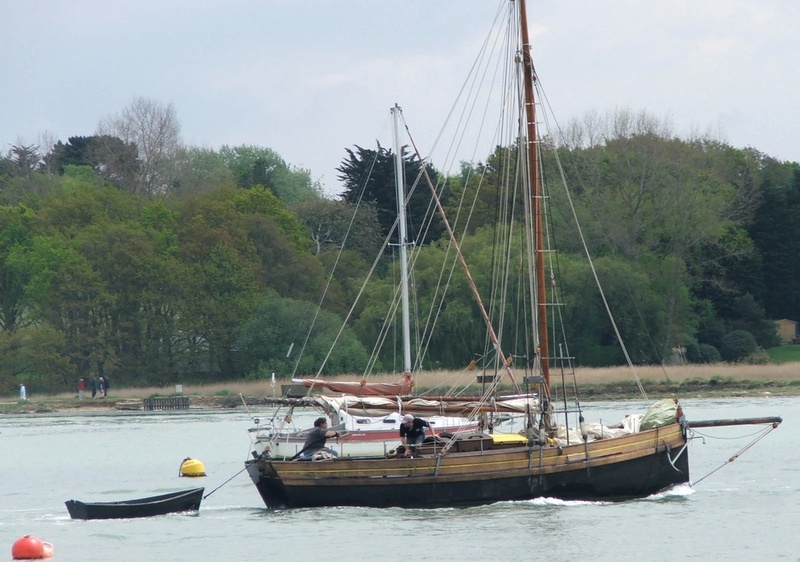 You would think that a modern race boat has up to date and sophisticated electronic navigational aids, plus the Bramble Bank is hard to miss, well apparently not. 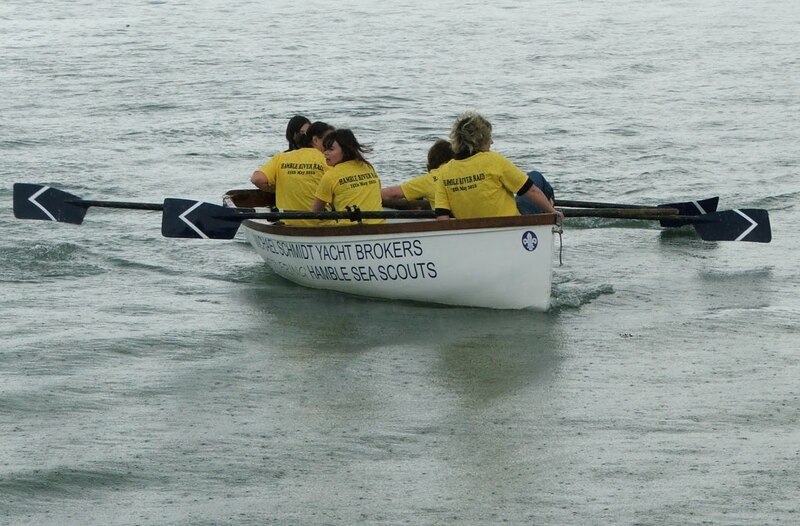 Shortly after the picture was taken, she motored off on the rising tide. 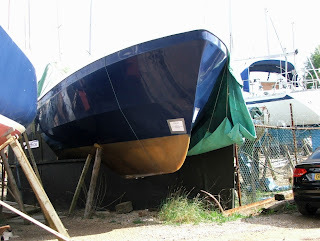 This boat always makes me smile, it's been here for a few years, clearly it wouldn't quite fit at the back of the yard. Now she's for sale, a bargain but the buyer must replace the fence!! I've been passing this drop dead gorgeous classic, in a local yard, for a few months now. She looks like a scaled up Dragon class. As well as brightly varnished planking which looks as like teak, her aluminium mast is polished to a mirror finish. 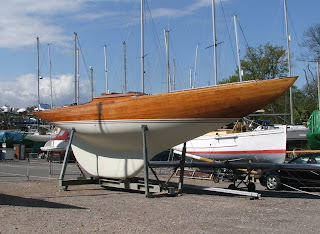 Some research on google suggests she is an 8 metre class - K36 built in 1939. 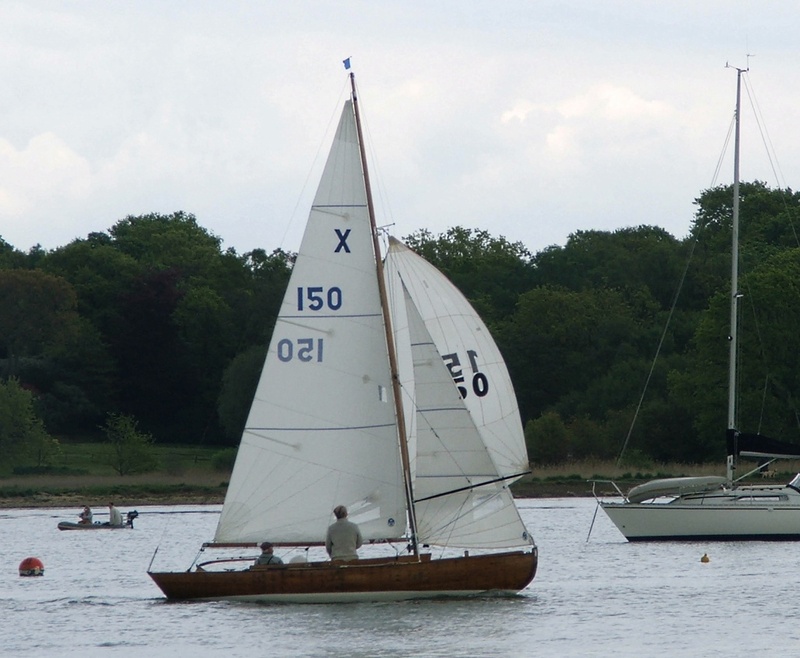 She appears on the entry list of the 2007 Metre Centenary Regatta at the Royal Yacht Squadron (RYS) listing Earl of Cork & Orrery/David Glasgow as the owner. According to superstition it's unlucky to change a boats name, but I think I might risk it for this one. 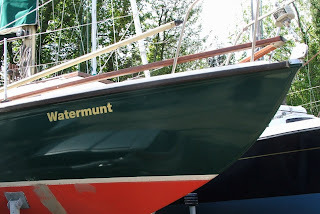 Apparently "Watermunt" is an aquatic herbaceous plant of the mint family, growing mostly alongside water and water meadow, flowering from June to late October.